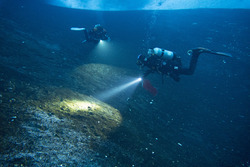 Scientific scuba divers use bright lights and cover lots of terrain in search for pycnogonids to collect. Turtle Rock, Antarctica. Photo by Timothy R. Dwyer. Cold-blooded animals in the Antarctic ocean have survived in near-constant, extreme cold conditions for millions of years and are very sensitive to even small changes in water temperature. However, the consequences of this extreme thermal sensitivity for the energetics, development, and survival of developing embryos is not well understood. This award will investigate the effect of temperature on the metabolism, growth rate, developmental rate, and developmental energetics of embryos and larvae of Antarctic marine ectotherms. The project will also measure annual variation in temperature and oxygen at different sites in McMurdo Sound, and compare embryonic and larval metabolism in winter and summer to determine the extent to which these life stages can acclimate to seasonal shifts. This research will provide insight into the ability of polar marine animals and ecosystems to withstand warming polar ocean conditions. 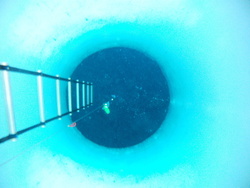 The only way below the ice is through one of these 4ft (1.3m) diameter boreholes. McMurdo Station, Antarctica. The team will be based out of McMurdo Field Station, Antarctica and will be taking day trips to a variety of dive sites. They will drive to most of their sites via PistenBully, though a few will be accessed by helicopter. Amy Osborne is an educator who strives to foster curiosity, a love of learning, and a connection to and stewardship of the natural world with students and adults. In her current role as Education Manager at NatureBridge, a K-12 residential environmental education non-profit that partners with the National Park Service, she leads and trains a group of 27 outdoor environmental science educators. Amy grew up in southeastern Ohio where she spent her days playing outside and getting dirty in the forests, creeks, and rivers of her hometown of Marietta. After eleven years on the water as a rower and rowing coach at Washington College and the University of Southern California, Amy left rivers and boathouses behind to pursue an M.A. in Teaching from Johns Hopkins University. She spent five years teaching 3rd and 4th grade at Carlin Springs Elementary School in Virginia where she discovered how much she loves teaching science! A year after leaving Carlin Springs to wander the world she found her passion for cold places, field research, and place-based outdoor environmental science education at Teton Science Schools graduate program in Jackson Hole, Wyoming. Returning to California in 2009, Amy has continued her love of being near water and teaching outdoor environmental science at NatureBridge in the Golden Gate National Recreation Area near Sausalito, California. In her spare time Amy likes being on or in the water, climbing up things, and wandering through new places. She is excited to dive into the world of marine ectotherms in Antarctica. Penguins? Leopard Seals? Lichen . . . Whales maybe. Maybe some shrubby plants . . . All sorts of bacteria and small fish and maybe mussels and tidepool critters? Hi, Amy. This post shows just how busy this week and been. You are getting a full ... boatload of information this week. Animals in Antarctica- No GoogleCheating! Thanks Ale! I'm definitely looking forward to checking out the critters in the ocean, finding out more about the research, and just simply being in Antarctica!